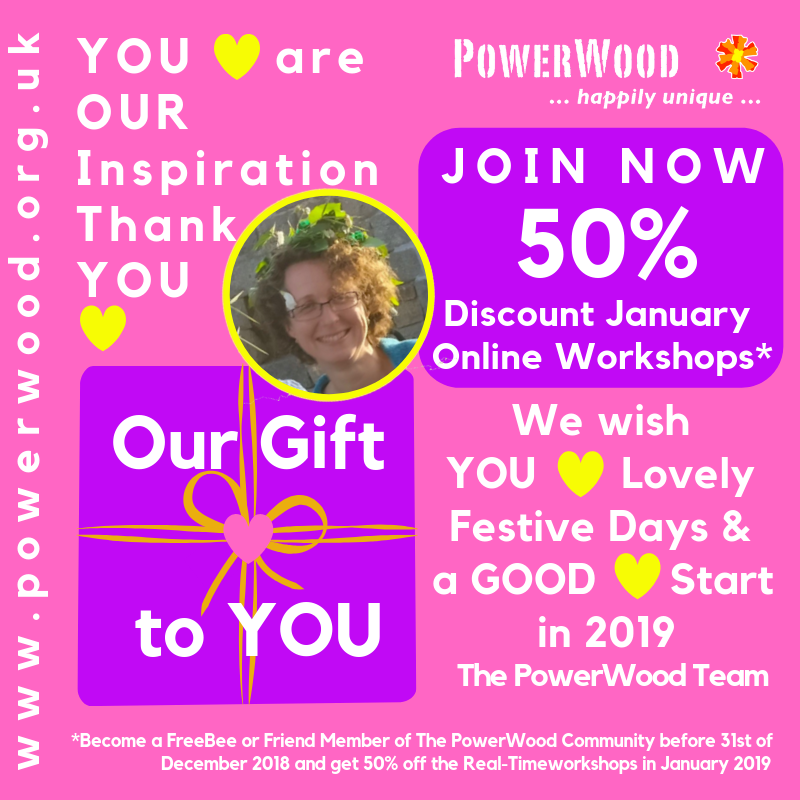 Thanks to the expertise, time and energy freely shared by so many PowerWood Active Contributors we present to you our new PowerWood website:)! Thank YOU, Merlin, Bianca, Abigail, Tine, Kate, Phil and all the other people who helped and inspired us during the last year to make this happen. Introduction to the Multilevel Emotion Regulation Theory (MERT) developed by Simone de Hoogh. March 2018 PowerWoods GoodNewsletter Five Years Community Celebration – ‘Am I a rubbish mum? The unexpected value of self-criticism’ – Living with PDA? “The violence towards me from my child was constant” single mum of a child with Pathological Demand Avoidance (PDA). June 2017 PowerWood’s GoodNewsletter: “The best camp ever” Second Power of the Woods weekend, 4-7-8 breathing exercise and PowerWood Camp coming up! December 2016 PowerWood’s GoodNewsletter: Hope and Light for the Festive Days: Grant for Power of the Woods Project, Interview with Ella (12), join PowerWood Camp with early bird discount:)! September 2016 PowerWood’s GoodNewsletter: Connect, share and empower in Amersham and East Sussex, “My son had been diagnosed with many things before” how a family found clarity etc. June 2016 Podcast: Wavelength 5.2 : Simone De Hoogh from Powerwood CIC on Authentic Communication Training. May 2016 PowerWood’s GoodNewsletter Intriguing interview, Extra Authentic Communication Training, Summer Camp and how your donations contributed to PowerWood:)! PowerWood Newsletter March 2016 Spring is in the air…. Dare to indulge yourself: Give yourself an inspiring heart-warming day for YOU only, book the London Workshop: Enjoy feeling connected, understood and strengthened. Be part of our Community:)! PowerWood Newsletter February 2016 Interview: “Our son’s constant questioning leaves us feeling exhausted”, A new day: London Workshop Weekend, Join us and grow your confidence! Volunteer with PowerWood:)! PowerWood Newsletter October 2015 Last chance to book East Sussex workshops and a HUGE Thank YOU to the enthusiastic and skilled volunteers of PowerWood Camp:)! Listen to this PowerWood Podcast that the children, tweens and teens made during PowerWood Camp 2015 by interviewing each other and thank you Lucinda Guy of SoundArt Radio for offering this inspiring workshop at PowerWood Camp, the children loved making it, and we loved the results! It will give you an insight in what is going on during the camp and how children and their parents experience the camp:)!